More than a year after the great Alberta flood of 2013 that deluged much of Calgary’s downtown and left it without power for five days, there are still lessons to be learned and applied by the real estate industry when it comes to wide-scale crises. One of the key takeaways from the great flood of 2013 in Calgary – or the lesser flood in Toronto and/or the ice storm in that city last December – is the recognition that these are not one-time events. In fact, given global climate change, they will happen with more frequency, unpredictability and severity. 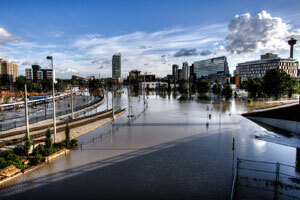 “The Calgary flooding really brought to light a lot of the issues that property managers need to address and be prepared for,” said Daryl Babb, regional director of Colliers International Canada. The reality that disasters will continue to strike and that managers need to be prepared was hammered home earlier this month when a fire in an electrical vault resulted in part of Calgary’s downtown again losing electrical power for days. “The recent electrical crisis really brought things again to the forefront and allowed a lot of property managers to test their systems that they have put in place through the flooding. As an industry, we came through this one a lot better-prepared,” said the Calgary-based Colliers executive who gives the city’s property managers high marks for their preparation since the June 2013 flood. In the wake of the latest Calgary outage, Colliers senior management this week held a conference call on disaster preparedness and the creation of an updating document on the subject for staff and clients. * The safety plan for employees and tenants needs to be fluid, and the lines of communication are key. With power outages possibly affecting the standard ways of communicating, property management companies need to be equipped with additional ways of contacting and communicating with a large number of tenants, owners and employees to keep them informed. In the last few years, social media has become an extremely efficient way of communicating key messages and up-to-the-minute, accurate information. * Property management companies need to manage and plan every contingency to ensure the safety and well-being of the staff, tenants and occupants of the properties they care for, first and foremost. Creating and implementing a comprehensive emergency and disaster plan can aid in reducing the threat of emergencies. * Depending on the type of emergency or disaster, property management companies can help tenants and occupants better cope by providing resources and tips. These include things like sharing checklists for flood safety, hurricanes, power outages, and/or by directing tenants and employees to resources such as media websites or government websites. Preventive action such as ensuring emergency contact information and processes are well-known to occupants, as well as practising emergency drills can help to create a calm and purposeful atmosphere. “If it is a situation like we just went through without power, you are not going to have e-mail or phone lines, so how do you get ahold of people?” noted Babb. “One of the lessons that came out up in this (power outage) is that in this day and age we want to put all our stuff online, we want to have it all electronic in terms of our phone lists and emergency lists. Babb noted that Colliers usually maintains three emergency contacts for each tenant and it maintains a 24-hour service line tenants they can call in the event of an emergency. The Colliers exec also gives high marks to BOMA Canada and its regional chapters which “has been a very good communicator of what needed to be done during the flood” and subsequently setting goals and standards for the real estate industry.